Click the image below to link to Patient Emily’s blog post about her experience with Pet therapy during treatment for Breast Cancer. ...creates a wonderful diversion in addition to making my hands (that have been affected by the cancer in my bones) feel so much better. ...What a wonderful program being offered to us undergoing treatment. The following post-Journey note was submitted by the winner of a two-night stay at The Tropicana Casino-Resort in Atlantic City, N.J. Out of respect for the patient’s request for privacy, we have omitted her name from this post. I just returned home this afternoon and I already want to go back. It’s another world down there– and a great way to have a mental break from my medical issues. As you can imagine, you cannot think of needles, drips and doctors when you’re playing the slots! And when I wasn’t at the casino, I had the chance to take a leisurely stroll down the boardwalk and occasionally stop and stare at the ocean. Beautiful. It didn’t matter at all that my friend and I went to Atlantic City in February. The weather was lovely and, even better, the traffic on the Garden State Parkway was lovely as well! What a beautiful, thoughtful gift. I am so grateful for the generosity you’ve shown me. The following is from Patient Scott M. Univer, in regards to his Massage Therapy experience. “...During my treatments I have had several hand massages...I believe I have benefitted substantially. Excerpt from a post-journey note by Gerolyn Martinez, who won a seven-night stay at the Marriott Vacation Club Fairway Villas resort near Atlantic City. She travelled with her husband. “...When you leave New York, you forget that people who don’t know you say, “good morning”...We took advantage of a lot of the amenities that the resort offers. I regularly went to the spa, pool, sauna and whirlpool, and my husband loved the gym. “...a surprisingly wonderful day...On a whim I decided to visit Lisset at Cleopatra's Touch salon - which is in the radiation suite at Roosevelt Hospital. Lisset immediately greeted me with her wonderful personality - and styled my wig; giving many helpful tips along the way. This was followed by a full make-up session, in which Lisset not only applied the makeup - but also showed me how it is done...and why. on top of it all, she gave me a professional makeup kit so that I can repeat this at home every day...Wow, what a gift!!! Finally, Lisset gave me a professional manicure...and I walked out of the hospital feeling completely rejuvenated! 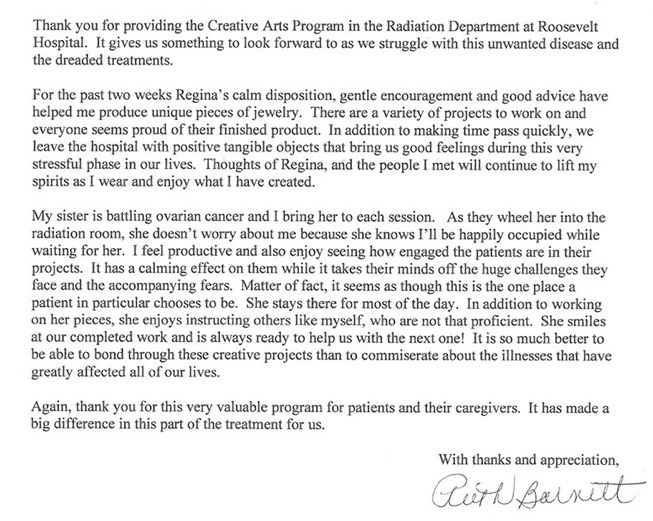 When I commenced my radiation treatments for breast cancer at Roosevelt Hospital, another patient told me about you. One morning, I reluctantly walked into your little area while you were working on someone's hair. Right away I felt comfortable and I just waited until you were done. I sat in your chair and you proceeded to talk with me and it felt as if we had been friends for a long time. You cut my hair, introduced me to a product, and blow dried my hair. Not only did you do a great job, but you cared about my feelings, and you made me feel beautiful. Other patients would come in and ask questions about their wigs, their, their nails and you were so friendly with everyone. Once again, THANK YOU. It's people like you that make help us go through these tough times in our lives so much more bearable. Again, Lizette, God Bless you and the work that you do for us. When I first came to Cleopatra's Touch (what a great name!) a couple of months ago, I was still in "overwhelmed" mode. I was feeling like a puzzle to yet be put together, so I didn't even know where to begin as this challenge came with no picture of the end product or process. I had had one round of chemo by then and while I still had hair when I saw you, my scalp felt like it was simmering at times. You recommended that we cut my hair short and you shaped my eyebrows beautifully. I was ever so grateful for your acts of kindness because it was sorely needed. Just by looking at me no one could tell that I didn't have the budget for those luxuries. Cleopatra's Touch is not about getting "free" services. It is about human understanding based on those who've gone before those of us now challenged by cancer. Whether the challenge was personal or through a loved one, we know the toll it can take. Such pioneers remember their own needs and struggles. Graciously they exercised the compassion and forethought to anticipate another person's need in advance. Sometimes in the midst of the storm, we are not aware of what we need because the line between wants and needs can become blurred. But Cleopatra's Touch and all that is provides through you is spot on! ...Please share with your sponsors how grateful I am and so many of us who would really send a note if they were able to. Let them know that we truly need you and Cleopatra's Touch not just for ourselves but for those who will come after us. 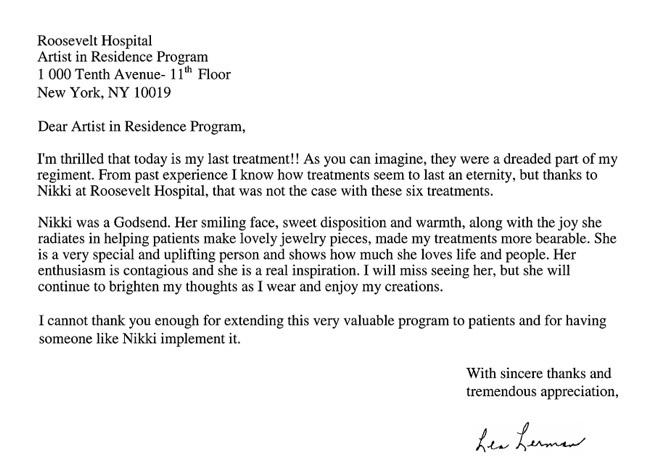 “During my treatment at Mount Sinai Roosevelt Hospital, I received hand massages whenever I could...just wonderful. This is a wonderful program you have.